Oregano grows throughout Europe and Asia, Greece, Turkey, Egypt, California and New Mexico. Mexican oregano is also known as Mexican wild sage and Mexican marjoram. 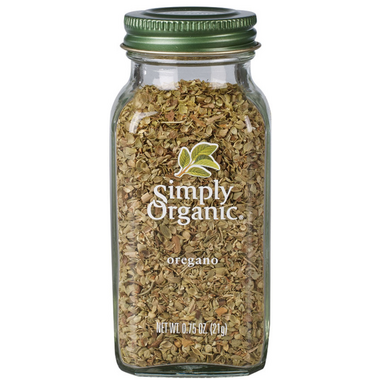 However, Simply Organic's oregano is sourced in Turkey. This has a beautiful aroma and taste. Love it. Rub some in your hands to release the aroma and this is absolutely delicious in any dish but I especially like it on a simple tomato, cucumber, and red onion salad. YUM!! burst of oregano flavour,can't be beat! Very competitive pricing too. Best flavor. Love the bottle! Would not use any other. Simply Organics Herbs & Spices are all so fresh and vibrant. I also love to reuse their gorgeous, reusable user-friendly bottles. The labels are easy to peel off for just that reason. To me that is the sign of a environmentally aware company - yes they can be recycled too but reusing is optimal. Simply organic are the best spices. Fresh and tasteful! This is much better in stews, soups, sauces than crushed Oregano. I'll be using this all the time. Thank you!! Delicious and adds such a fresh taste to tomatoes and veggies. I love oregano simply organic. Ty for carrying this. I like trying to eat organic spices etc. This herb is excellent and way superior to others (dried herbs) I've tried before. Absolute must in the kitchen cabinet ! Love this brand of organic spices. Great flavour. Only small complaint is the shaker holes are a bit small for oregano so you either shake like crazy or need to open the pouring part. Prefer the organic herbs so much tastier, and they are not irradiated or sprayed with pesticides, herbicides, fungicides or round-up..so much better!! Delicious addition to homemade soup! Organic is such a bonus!